Game Freak has an advantage that many other developers around the world don’t: Job security. They have parachutes in the form of Pokemon and Nintendo. While they seemingly focus their efforts on Pokemon, we’ve also seen them give birth to cult titles like Drill Dozer, HarmoKnight, and even the non-Nintendo Tembo the Badass Elephant. Employee projects have been given the opportunity to thrive with a policy that encourages independent creativity. That policy has yielded another great game with Pocket Card Jockey. 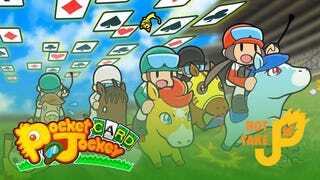 Pocket Card Jockey is one part horse racing and three parts solitaire. Mixing these two types a game give Pocket Card Jockey a depth and strategy that most downloadable titles aren’t usually afforded. Stacking cards is easy to understand which is great. It’s difficult to master which is better. I cannot understate how creative and fun this gameplay is. Gameplay is difficult, but never feels unfair. Despite being a card game, you never feel cheated out of a win. You’ll know the mistakes you’ve made. You’ll know “I should have put used that six instead of the one on the other stack”. Again, the complexity can feel overwhelming, but the first time you turn the corner to the home stretch and it’s all clicking you’ll feel the magic. The humor is top notch. Game Freak doesn’t have much freedom with dialogue in the Pokemon games, but Pocket Card Jockey is rife with in-humor, sly references, and many fourth-wall breaking conversations. It’s always a nice touch when you have fun reading the dialogue between characters like this. Horses all have unique traits and stats, and while most are easy to understand some skills and characteristics are more difficult to tease out how they effect your races. It’s one more layer of depth to the gameplay, but without an explainer you’re left hoping you have a horse with good traits. I have yet to figure out the StreetPass functionality. Or the breeding. While usually the little tutorial horse is happy to explain every detail (excruciatingly so) he has yet to explain breeding to me. I’ve put two horses together at the barn in the hopes of getting a super-colt, but after a month of waiting I’ve gotten nothing. Pocket Card Jockey is the perfect game for bite sized but challenging bursts. The depth and complexity will satisfy even the most finicky of casual card game players. I’ve enjoyed the balance of gameplay and challenge and have played it often during Metro commutes to work. If you’re not convinced and own a 3DS, try the demo available on the eShop. And if you figure out how breeding works, tell me.